I’d heard good things about the new Gastropub in Newtonville, Brewer’s Coalition, so we brought along our middle child in 5th grade who is our most adventurous eater to check it out. She enjoyed feeling like an only child. The hostess gave our daughter a child’s menu and a coloring sheet with a box of four crayons. Even though my daughter prefers to order off the adult menu, I always think that a kids’ menu means that children are welcome. My daughter had been feeling uneasy coming it; she viewed it as a restaurant for old people (but everyone seems old to her as she’s just 10-years-old). My husband thought the decor was a little spartan but I liked it. The hard wooden chairs were uncomfortable to him but I sat on the upholstered booth side. I’ve heard that some restauranteurs deliberately pick uncomfortable chairs to hasten turnover. Our waitress was very friendly and helpful and we ordered a lot of appetizers to try as much as possible. 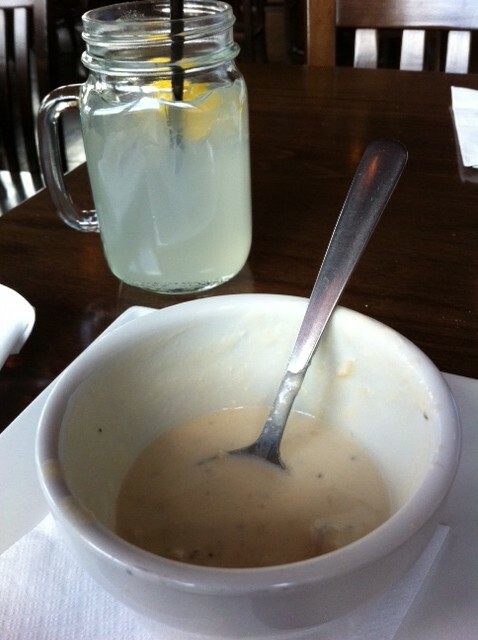 The clam chowder came out first. It was rich with cream and we ate it so fast, I forgot to photograph it until it was nearly gone. Our daughter gave it a thumbs up. It’s definitely homemade; I hate it when restaurants serve canned clam chowder. My daughter order the sliders and was pleased to find bacon nestled inside. I traded her for one and it was delicious. The buns were perfectly toasted and the hamburger meat was juicy. My husband ordered the fish tacos. 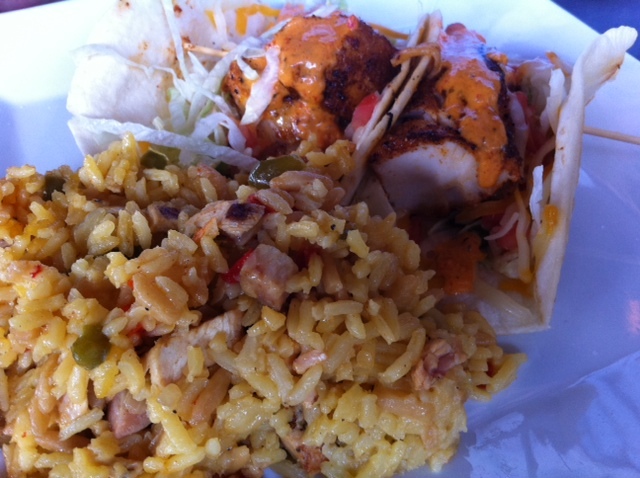 We dream of fish tacos having grown up in California. They are hard to find in Boston. Usually, we have to make our own. The fish was fried to a delicate crisp without being overdone. The sauce was creamy with a hint of spicy jerk seasoning. It was perfection! I also appreciate that the tortilla was warm. There’s nothing worse than a cold flour tortilla! 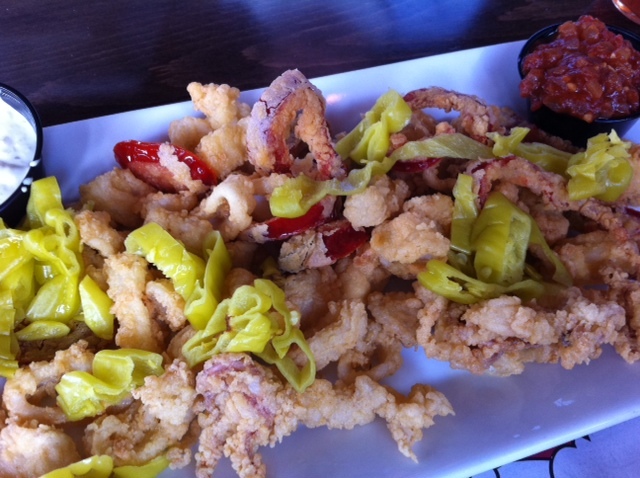 My husband always orders the fried calamari no matter where we go. It’s amazing that Thai, Vietnamese, and Italian restaurants all have a version of it on their menus. The batter was ethereally light but the timing was a tad off. 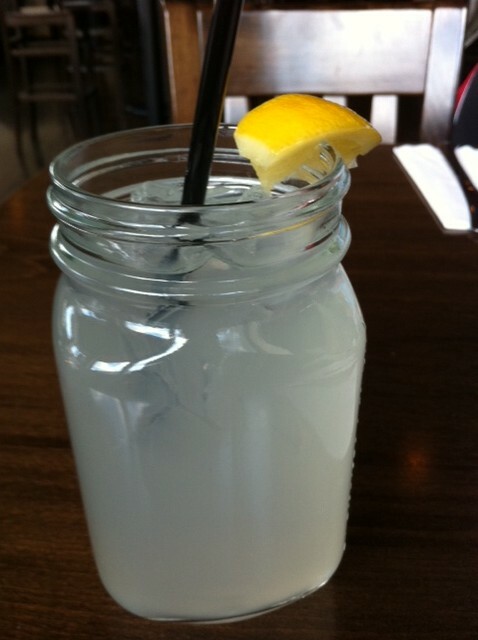 It was lukewarm when it hit our table. Still, we enjoyed it. 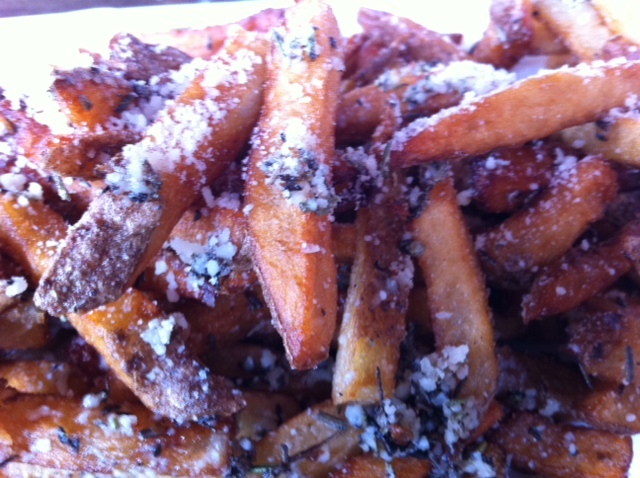 I wanted to try the truffle fries after sampling amazing ones in Allston at Common Ground. Both descriptions were similar: truffle oil, thick hand cut potatoes, and Parmesan cheese. The truffle fries here were seasoned with fresh rosemary. I love rosemary but I would have preferred a different ratio: half the rosemary and double the cheese. The fries were a little overwhelmed by the profusion of rosemary. I think Common Ground has spoiled me forever in the truffle fry department. The carousel horse is a nice addition. My husband sat with his back to it so I don’t think he even saw it. That may have influenced his “sparse decor” comment. The walls were lined with a collection of beer bottles that spanned the restaurant. My daughter was impressed by the sheer vastness of the collection. Overall, we liked Brewer’s Coalition a lot! 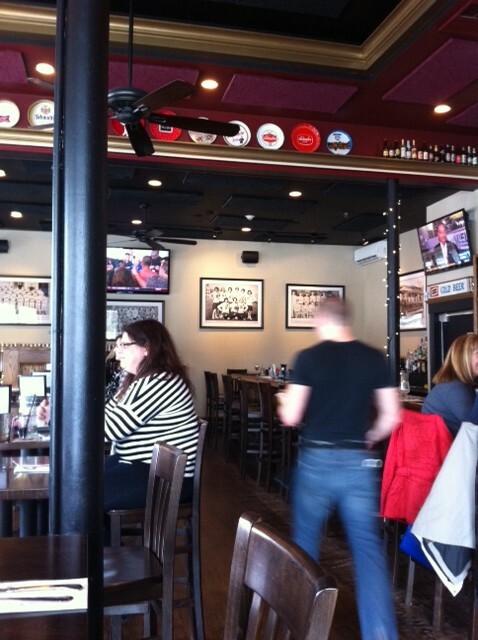 It’s a nice addition to the Newton Gastropub scene. Think The Local but with better parking. We’ll be back! I imagine that it must get very crowded at night! As I can see, they have a lovely hospitality for their customers, and judging on the pictures of the food you just ordered, it made me drool, it looks so delicious. I want to try to eat here sometimes with my friends or with my family. It is a fun place! My friends are also raving about it. I hope you get a chance to check it out.